Our new bungalow boast two full bathrooms. Naturally I’ve decorated mine with pink flowers, green leaves, purple towels, an astonishing assortment of vintage and antique dresser jars, perfume bottles, and a truly horrifying clock surrounded by pink ceramic doves. Nestled amidst the carefully scattered clutter is this pretty porcelain piece that I’m using as a hair receiver. It’s late 19th-century — a childhood gift from my godmother’s best friend, who was an antique dealer. And it’s not actually a hair receiver. If it was, it would have a little hole in the center of the lid through which to poke the hair and swirl it into the forming rat. In case you’re reading this and wondering, what on earth is she talking about, or if you’re just thinking “ew, that’s gross,” I’ll share a little background. In the 19th century, frequent, vigorous brushings were a good way to keep your hair clean between occasional washings. Brushing spreads oil from the roots, where it seeps out of your scalp, down to nourish and protect fragile ends. It also pulls out weak or damaged strands so that new, healthy hair can grown in. 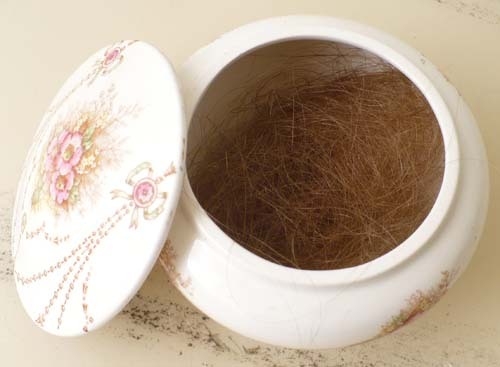 Women saved those pulled out hairs and used them to make the rats and pads required for many 19th-century hairstyles — their ears didn’t stick out that much without a little help! I’ve made four or five rats since my hair grew out. It takes months of brushing to get enough hair together. On a side note, I recently found a strand of my own hair on my desk and decided to measure it (it was a slow evening). Thirty-one and a half inches — nearly a yard long! And, to my great delight, the California sun has exaggerated enough blond and red highlights to eliminate the mousy brown I’d developed after years of dreary NY winters. 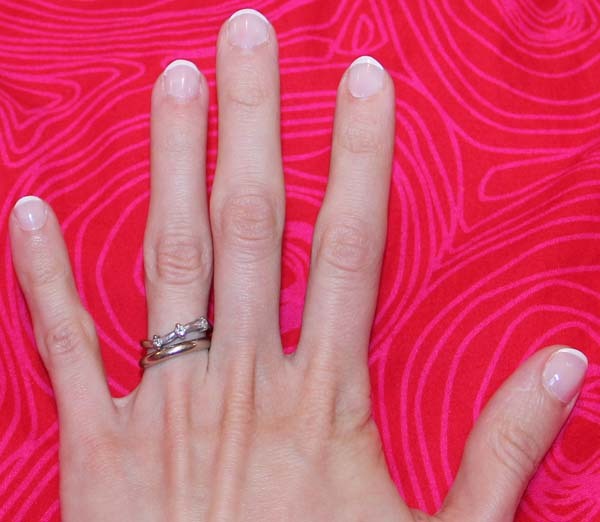 While preparing to stand up as bridesmaid for a dear friend, I had occasion to give myself a “french manicure.” There wasn’t time to go to a nail salon, so I picked up a kit at the drug store and did my best. Considering it was the first time I’ve painted my nails in years, I must say it didn’t turn out badly. A NEW EMPLOYMENT FOR AMERICAN WOMEN. Then she proceeds to describe the office and equipment of a “manicure,” to whom she went for curiosity’s sake and for an item or two. “After a tedious waiting, my turn at length came, and I seated myself by the manicure’s little table, upon which were scattered the tools of her trade. These were scissors and knives of a shape specially devised for the trimming of the nails, files, nail-cleaners, a small basin of rose-water with a bit of soap near it, a tiny towel of linen cambric, a bit of lemon, and various polishing powders and sweet-smelling unguents in the form of ruby colored pomades. The first step in her proceedings was to wash off the finger-tips carefully, then to dry them, after assuring herself that there were no ink spots or other stain upon them. Then she clipped and trimmed the nails into the approved filbert shape, neither too short nor too long, nor too pointed nor too broad; the ‘halfmoons’ at the base of the nails were gently brought into clear light; all ‘hang-nails’ were amputated; and after this she rubbed a coral-colored pomade of a delicious odor upon the nails and the upper part of all the fingers. After allowing this to remain a little while she wiped it off again, and scattered upon the nails a golden brownish powder, which she vigorously rubbed with the whole length of her powerful forefinger, occasionally aided by the palm. More pomade, more powder, more rubbing, and then the nails were shown with that beautiful gleam upon them, that pearly pinkness, seen in the interior of some delicate sea-shells. As the pedicure had said, the manicure’s manipulations greatly ‘advantaged’ a pretty hand, but even in a greater degree advantaged an ugly one. As in Paris, there are many people of wealth and luxurious disposition in our large cities who would readily avail themselves of the attentions of a manicure, and it is in the nature of things that the establishment of such an art in America would have a tendency to improve the manual habits, so far as neatness is concerned, of our people at large. I realize it’s rather silly to think of one’s own hair as historical research, but in a way, it is. I’ve been growing it since 2006, trimming the ends in the bathroom as needed. With no bangs, layers, or other modern styling, it’s as close as I can get to mid-19th century hair, without forgoing shampoo and rubbing it with pomade. I actually spent a few weeks using only period hair-care, but decided to abandon that effort until the next time I’m stranded on a desert island. Long hair is a bit of extra work — washing it takes forever — and it gives me a headache if I put it up the wrong way. But it’s actually much cheaper than a shorter style that needs professional cutting. And I never bother with expensive products. Just natural shampoo and conditioner, with colorless henna for a little extra shine. There aren’t really many people left who’ve seen me with truly short hair, but more than a few of them have told me I looked a lot better with a close crop. Perhaps they are right. Certainly the center-parted, over-the-ears style of the 1850s isn’t very flattering. 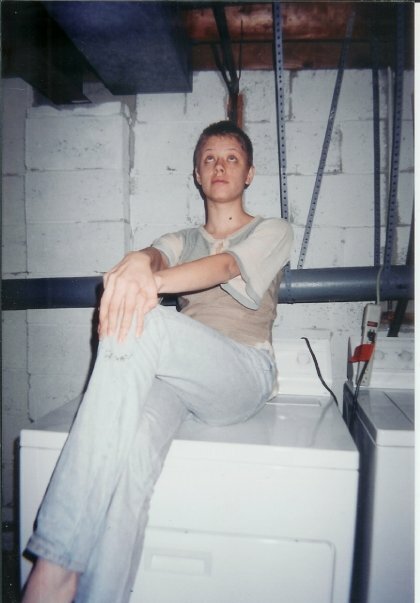 Here I am in my Jean Seberg stage — they used the clippers for this cut.